One of the more popular posts on this blog detailed how to create and deploy a Generic ASHX handler with your SharePoint projects. While you can still do this manually per that post, this is made much easier with the inclusion of a new item template that is part of the CKSDev tools extension. 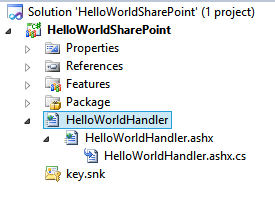 Since this particular change set and version 2.3 of CKSDEV, there is now an ASHX item template that you can use to create and deploy generic ASHX handlers to your SharePoint farms. Generic handlers are a lightweight and quick way to “roll your own” SharePoint web services layer, and I’ve used them quite a bit. Especially in AJAX anonymous access scenarios (where the Lists.asmx services will not work), generic handlers can be easily deployed to the LAYOUTS or ISAPI virtual directories and act as a nice shim/proxy to provide data to client-side callers. Once you’ve given it a name and clicked Ok, you’ll see two files, one with .ashx extension, and the other code-behind file with .ashx.cs extension. You shouldn’t have to edit the .ashx file at all, unless you want to reference classes from other SharePoint assemblies in your code behind, like Microsoft.SharePoint.Portal, or Microsoft.Office.Server.UserProfiles, etc., in which case you need to add an @Assembly directive for each of those dlls. There is an @Assembly reference for Microsoft.SharePoint.dll already setup. As of CKSDEV 2.4, the Item Template doesn’t set the Build Action properly on the .ashx file, so you need to manually set the Build Action to Content yourself. Special thanks to Wes Hackett for taking my contribution and making it work properly within the CKSDEV framework. I tried this out and tried the manual way you linked as well. Everything works great in IE but in Firefox I am getting a 403 Forbidden error. Any thoughts on why this would be? Tough to say. It could be that firefox is not passing in the user’s credentials, and they are coming in anonymously. The ASHX handler should run for anonymous users (_vti_bin deployed services will respond to anonymous access requests if you configure the web app to support anonymous access). But it’s possible you have some code in your handler that accesses something that requires authentication, and SharePoint is throwing the error. Try to debug your handler and see if it fires at all, and if it chokes on a certain line trying to access something, and if the user is anonymous when it hits the handler. How can I install de CSKDEV in my Visual Studio 2012 ?!?! I installed this but no ASHX handlers to be found. That’s the right one. Make sure you aren’t developing a sandbox solution. Also make sure you have restarted Visual Studio after installation.